Our first postapalooza lasted from June twelfth to the twenty fourth! We had a total of twenty three posts!! This postapalooza ended because I missed a day among all of my travel to Japan. If you think I missed a day or doubleposted, its just because of the time zone change. Swype is a way to replace typing by instead of touching the keys you swipe over the letters on the keyboard to create the word instead of typing them. It has already broken the world record for fastest typing speed. Luckily, Swype is allowing beta users on Android. And thanks to my Droid Incredible I got the chance to try it out. As you can see, it may take a little bit of practice, but there are other videos where people are much faster than me. I’ll probably be able to swype a bit faster when Im not in japan, as here it is so humid my screen fogs up and becomes sticky. Swype is rolling out on many new phones and the beta seems to work just as advertised. To get swype, you need to have an android phone, an internet connection (which it looks like you have), and an email address. Just go to beta.swype.com and register. Make sure you can access that email address on your android phone. After registering, check your email on the phone and click the link. You will need to allow third party installations, which the process varies depending on your phone. Once it is downloaded, open it and login with the information you entered into the swype website. Continue through the rest (it is quite self explanitory) and once it is done installing, just long press any text field, select input method, and select swype. Tada! You’ve just installed swype on your android phone. New betas are always on the way, and there are numerous tips for Swype here. If you’ve been reading Good Morning Geek since 2008, you may remember the times of maxswisher.blogspot.com. I liked that because it was completely free and easy. Then you may remember the times of goodmorninggeek.wordpress.com. Just as easy and free. Then, you may have realized that goodmorninggeek.com worked. That was just a redirect. I was getting tired of not having much flexibility and storage (I was on Hurricane Electric which gave me 5GB/mo. ), and because I was now earning some more money, I decided to get some real hosting of my own. After asking around at the Teens In Tech conference, I concluded that Media Temple would be right for me. I signed up for the Grid Server (gs) plan, which is 100GB, $20/mo (or $200/yr), and 1TB of bandwidth. I had no idea that those $20 gave me SO MUCH. But there were 2 things that really made it for me. Using this service I installed wordpress on this domain with a FEW (:O) clicks. I then imported the posts from goodmorninggeek.wordpress.com. You can install wordpress, drupal, and zen-cart with 1 click. Because it is grid server, I can have different domains linking to different directories on a single hosting. That means that maxswisher.com, goodmorninggeek.com, teentechie.net, and every sub-domain is on a single $20/mo. hosting plan. Definitely recommend this to everybody who is looking to host their own website. In fact, skribit (they power the suggestions tab on the left) uses (mt). Who knew?! You can now get a Good Morning Geek T-shirt, mug, messenger bag, hat, or even clock at the Good Morning Geek Shop. Click here to visit the shop, and click Apparel in the top left at any time to go to the same place! The current design on all of the items is shown below. Thanks! You may not know this, but it is possible to favorite a tweet. It’s supported in all twitter clients and the website. Unfortunately, it is difficult to see what tweets a user has favorited (I haven’t been able to). But this service from my friend Spencer Schoeben makes it so a [yourtwitternamehere]favs account will retweet every tweet you favorite. For this example, I will be using the TeenTechie twitter account. The account that will have the favorites is considered the “Primary account”. For this example, that would be TeenTechie. 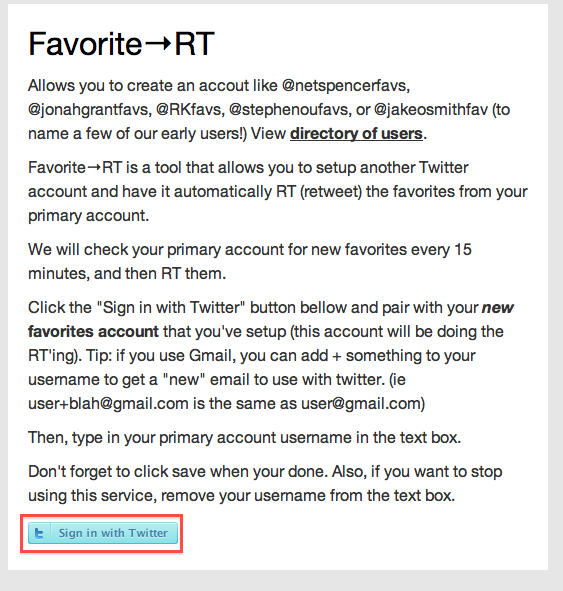 We need to create the favorites account that will retweet the tweets that TeenTechie (the primary account) favorites. That account should be [primaryusername]favs (TeenTechiefavs). Go to twitter and create the account. Go to http://spncr.me/favrt and click Sign in to Twitter at the bottom of the page. Frown in disappointment about the errors that occur. Don’t worry, the problem should be fixed in a little bit. Once it is fixed, I’ll write a post that shows you how to create the account SUCCESSFULLY!. In the meanwhile, save that [primaryusername]favs account, and while you wait, you might want to create a picture by taking the Primary account’s photo and putting a star in the bottom right (to denote the favorites account). We all have thoughts to organize. 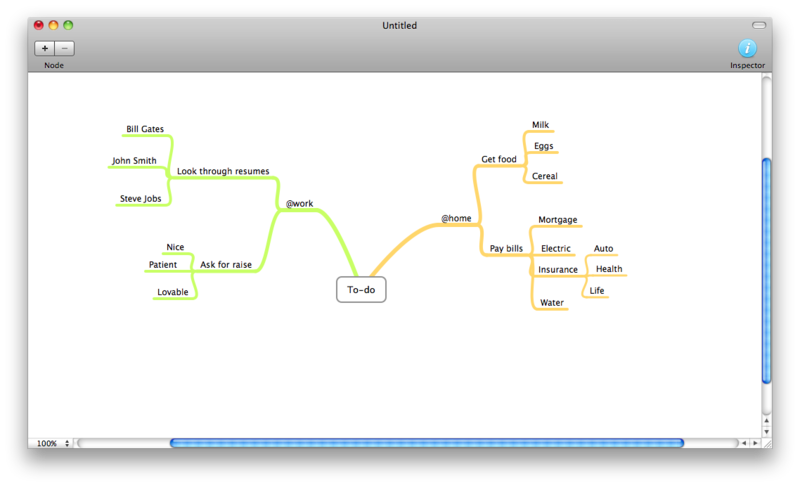 Mind maps are a great way of doing so, but a lot of software can be clunky, expensive, or hard to figure out. 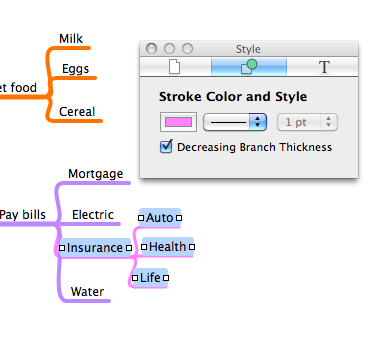 MindNode is a free, functional, and simple way of creating mind maps. Upon opening the app, you will be greeted with what is called the “supernode”. Every different branch coming off of the supernode is called a node. 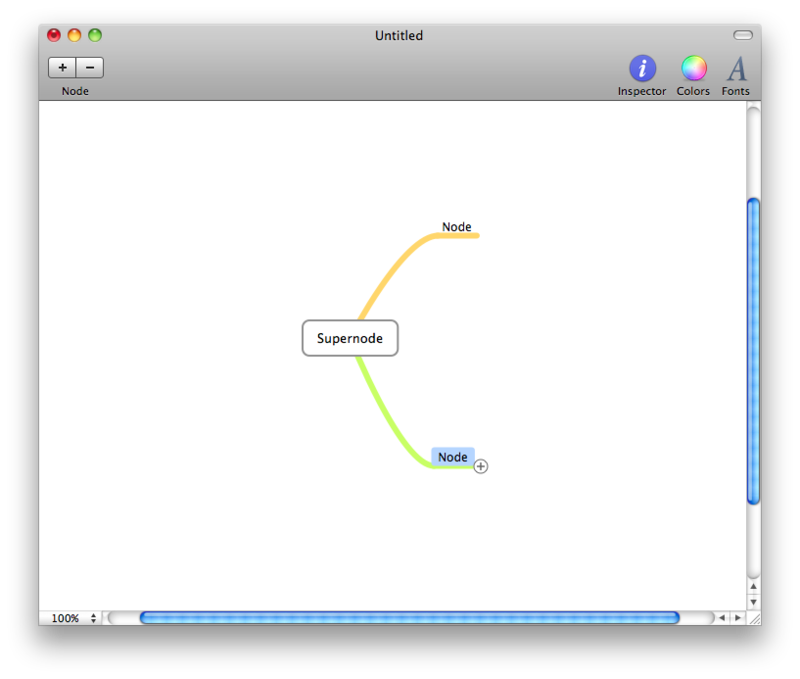 Click and drag the plus off of the supernode to create a node, and then you can type to name the node. When hovering over a node there will be a plus so you can create nodes off of other nodes. You can also configure the color of the nodes using the inspector (the i in the top right), which makes it easier to visualize. 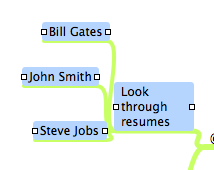 If you look closely, there are white squares to the left and right of every highlighted node (when you highlight a node that has nodes coming off of it, all of the “sub-nodes” are also highlighted). Click and drag one of the squares to resize the node to change text wrapping. It can also be used to separate sub-nodes from other nodes so you don’t get them confused. If you use both this and the ability to change the color, you can easily distinguish the sub-nodes. Click Here to download an example of the PDF. 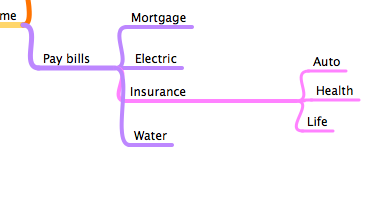 Thanks to it’s simplicity and flexibility, MindNode can be used for many different purposes. UPDATE: The site’s theme has changed. This post no longer applies. If you look at the top, you may notice a new grey bar with posts that go across. These may seem random, but I choose which ones appear. This posts are considered “featured“. I’ve decided to let YOU, the computer user, decide which post goes up there. So if you look to the RIGHT (–>) at the TOP (^^^) you will see something that says “which post should I feature?”. In the box there, type in what your favorite post has been. New reader? Look into the archives on the right to read some other posts, then tell me which one is your favorite! I am currently in Japan, and in the Hotel we have no wireless in our room. We do have a wired connection, but we have iPads that need WiFi. 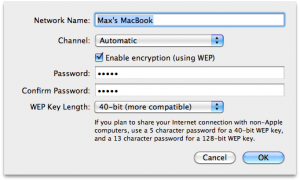 Here’s how to take your mac and turn it into a WiFi network in a few steps. into your Mac. Make sure the internet connection is working by visiting a few sites. Many hotels have pages where you have to agree to terms. Make sure you agree and/or pay before proceeding. Then, click on AirPort options in the bottom right. 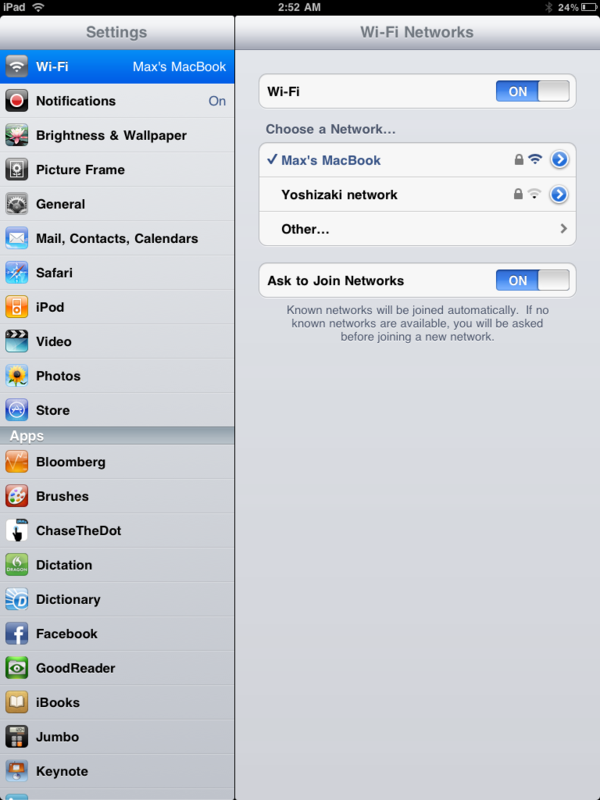 Here you can put in the name of your Wifi network and a password if desired. 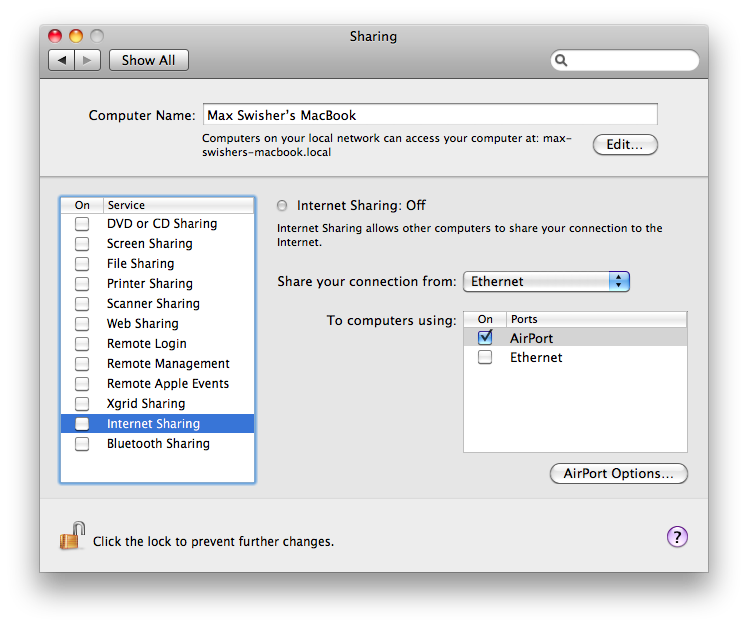 Click OK, and now you can click the checkbox next to internet sharing. 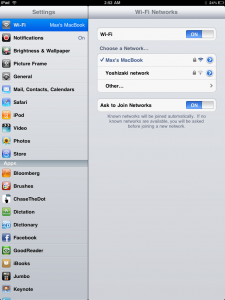 On your WiFi enabled devices you should be able to see a WiFi network with the name you put in under Airport Options in step 2. 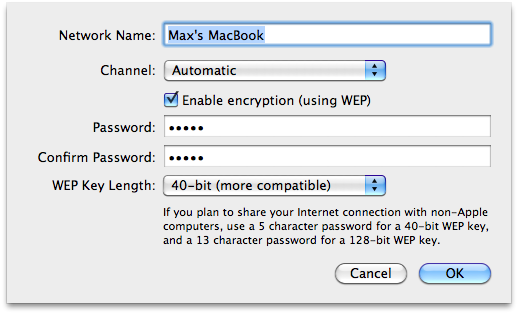 Connect to it and enter a password if you configured one. Tada! Now your devices should be able to browse the internet. Cool! 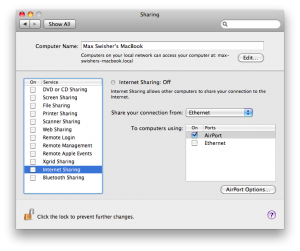 Be aware that you can’t be on a WiFi network on your Mac while sharing your internet. And that’s why there’s an app called Things, which won an apple design award, etc, etc. But that costs $50! Yah, umm… NO. so that’s why I love Remember The Milk. 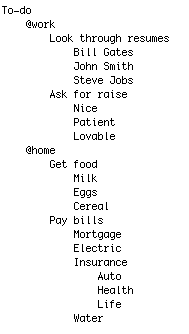 Remember the milk doesn’t have all of the features of Things (I’m pretty sure Things comes with a manual…), but for a great free online to-do list service, Remember The Milk is perfect. Remember The Milk gives you features like multiple lists, tagging, due dates, priorities, the ability to postpone, the ability to share tasks, and more. It also includes smart lists (similar to Smart Mailboxes or Smart folders), which can filter multiple lists. RTM (R.emember T.he M.ilk) will automatically sort items in order that they need to be done which depends on priority and due date. This is great becasue you just add in the things you need to do, and instead of spending 5 minutes thinking of which to do first the answer is right there in RTM. Also, I turn to RTM when I have nothing to do because I probably have something I need to do somewhere. I also use RTM to organize ideas for blog posts, and that’s how this postapalooza has been occurring (One post every day from Jun. 9 until an unspecified date). It has boosted my productivity by 7x (I used to have on post per week). And hit return, and it will be added to the list and sorted. You can also do similar things to ad due dates and more. Another cool feature is that you can have friends and share tasks with them. I haven’t yet been able to test out this feature, but at least the idea is a great one. For heavy users of RTM, you can get a pro plan which is $25/yr. This allows some extra features like access from the mobile app (If you don’t have pro, you can always just go to m.rememberthemilk.com on your mobile phone for a much liter interface) and some other goodies. Thanks to RTM and one other application (review coming… tomorrow probably), I am able to keep this postapalooza alive and I don’t know when it will stop… I guess when I run out of ideas. Some people have said some hurtful but understandable things about me, as said in the title of the post. Well, allow me to say, that I’m not switching over to chrome OS. I’m not switching to windows either, I’m just switching over to android. What’s the big difference between Mac OS X and iOS? Well, I mean other than one is a mobile operating system. Mac OS X allows development to run in the background. Mac OS X also allows applications to manipulate the core of the operating system (although not preferred). iOS is completely shut off. For example, people can’t even use their own APIs! It is a closed off system and it is completely CLOSED source. Android on the other hand seems more like Mac OS X. It is open source, so people can use their own APIs to do whatever they want. Apps still need to be accepted into Android Market, but there is an option to allow other applications that weren’t approved by the app store to be installed. And that’s what makes the difference. So I’m not exactly a traitor, I’m just supporting what I believe in and personally is best for me. I’m sure I’m not the only one…. Anyone?…….. Comments welcome. Who here tweets, IMs (or “Chats”), or emails? Sometimes I know I like to send people files. But if you are on IM it can take a long time and isn’t very compatible between different clients. So instead, how about you put the photo in the cloud and send them a link? Usually this would take a server and FTP access. But CloudApp makes it much easier. This is what I like to call “The cloud” (I think you understand why…). Depending on the size of the file, that shouldn’t take long. The answer is on your clipboard. Literally. Now you can just paste into the chat window and a link to the file will be sent. Cool! Opening the link will have different results: If it is an image, it will just be displayed in the window. If it is another file, there will be a download link so they can download the file. And that’s all there is too it. Just drag and drop, wait a few seconds, and paste the link. Now it’s easy to share files over twitter! Also, I know that some of you may just want to take a screenshot and upload that. I know I like to do that alot because I can show anybody what is on my screen without any confusing file conversions or prints. This means that it will automatically upload a screenshot right after it is taken. Cool! So you take a screenshot, wait a few seconds, and paste into the tweet or chat window. 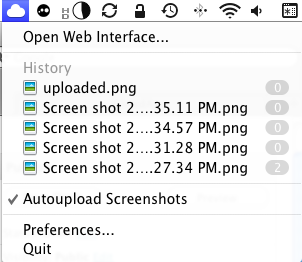 Now if you look up at that screenshot you will notice numbers next to the different files. Those files are my recently uploaded files, and those numbers indicate how many time each on has been viewed. Clicking Open Web Interface… will… well… open the web interface. There, you can delete uploaded files and more. Now let me warn you, getting the app is also a process. First, go to http://getcloudapp.com and click sign up. Then enter your email and desired password. Check your email and open the activation link. At the screen that appears, click on tools in the top left and the first item there will be CloudApp. Click Download to download the application. Once you’ve downloaded the app and moved it to your applications folder, open it up. You will see that cloud in your menubar. However, you need to activate it first. Just click on it and click Preferences. Then, click the accounts tab, and enter the email and password you used on your CloudApp account. Close the window and you are ready for uploading! Once you have downloaded the app and moved it to your applications folder, open up the app.